Recently I seem to be encoutering resistance in many areas, giving me lots of chances to practice dealing with a situation calmly when it is frustrating, being nice to people who are trying to help and are just making things worse, and maybe most important, learning when I need to make a U-turn and abandon my original plan to try something else. Earlier this week I had a client Skype session scheduled, and could not log into Skype! I use it regularly to connect with clients or my own coaches, and I really wanted to talk with this client but there was nothing I could do. Fortunately she was understanding and we rescheduled for the next day. I found out soon afterwards that my reliable (not!) version of Linux Skype, which I had just used 3 days before, was obsolete. The newer version fixed the problem. This morning I spent over an hour on the phone with PayPal support trying to get into my account. They’ve made some updates, and it was prompting me for security information I was entering correctly which wasn’t getting recognized. A warm non-technical woman spent a lot of time with me and had me do several things which did nothing to get me past the problem. Finally another person said he was removing this security check for me, and promised me I could log in in 10 minutes. Hours later, I still can’t log in so I will have to call again. The biggest example of this dynamic for me lately was an actual roadblock, and I could have handled it better. 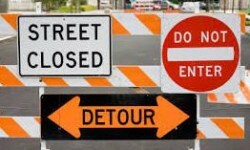 I was on my way to an energy medicine workshop, following the route I’d taken before, when I encountered a “road closed” sign. The roads here are winding like a nest of snakes, I didn’t have a GPS with me, I knew no other route, and I couldn’t get a signal on my cell phone to call and ask for other directions! The road on the far side of the closure sign looked straight and clear, so I went around the sign and continued. I soon came to the construction, bulldozers, and a road which was not driveable, with no people in sight. I was on an elevated section, a grassy field several feet below me on either side. The road ahead was struts and spaces, nothing I wanted to tackle. I decided to slowly drive down into the field to the right, go past the construction section, then try to get back up to the road. If I could rewind, here’s where I’d like a “do over”. Well, it didn’t work. I didn’t get stuck, but the grade was too steep — my little Honda is not a monster truck! I had to backtrack and go up out of the field where I had gone down, then go out the way I had come in and try to find another route. I wound up taking about an extra hour to get to my destination, asking for directions several times. The worst part was that I did some cosmetic damage to the front of my car from trying to muscle it up that steep hill. It bears the scars from my trying to force my will on a situation which couldn’t be changed. As always when I seem to be seeing a pattern, I wonder what the message is which is trying to get through. And where have I been doing this kind of thing with my vision? I must admit there were times when I tried to work with the eye chart and had it too far away to see much, which just got me upset and certainly didn’t teach my visual system anything except that it was failing at the assigned task! Or I’ve tried to force myself to do “vision practice” when I really needed a break from doing anything. In retrospect, palming would have been perfect at these times, but I thought I had to accomplish — relaxing didn’t count. Today I went to the local auto body shop, a family business where I know and trust the owners. The estimate for reparing the damage to my car (which isn’t obvious unless you look almost under the front bumper/spoiler) is higher than I’d hoped but less than I’d feared, and I’m going to get the work done. This feels like necessary penance. My sweet reliable car shouldn’t have to look like it was punched in the chin because of my stubbornness! I’m hoping I learned something from all this. Trying to “push the river” or fight what wants to happen is an exercise in futility. If I move the eye chart close enough that I can see the first few rows, I can get some useful practice. If I push myself to see something I can’t, more pushing will only make it worse and probably put me in a bad mood. If I can’t get there (wherever “there” is) by the route I wanted to use, if it’s somewhere I really need to be I’ll get there somehow. Please learn from my bad example. As you go forward, be willing to course-correct. Pay attention to feedback and let it guide you. A “road closed” sign probably means you don’t want to go that way! I’m never sure. Never. But I learned several years ago during a time of real turmoil to turn to God (yeah, I actually look to the sky as sort of a ritual) and say, “I’ll take the LESSON.” By that I mean, what appears to be just another problem is always a lesson and an opportunity for spiritual growth. I surrender my ego and will. I just relax and ask for guidance. My life is a lot more balanced since that approach dawned on me. You get it. I’m just writing to corroborate and agree with your experience and sound advice. Thank you, Nancy. Next Next post: I Choose To Accept My Fears — Not Really!